We have expertise in manufacturing and supplying quality range Brass/Metal Beads that are available in varied designs, shapes, textures and sizes. Made using metals, we offer these beads in conformity to the latest trend and fashion that portrays the perfect blend of antique and contemporary fashion. Collection of sterling silver and brass beads waiting to be explored by our quality and style conscious clients. We are engage in manufacturing of brass beads in india with superior quality of brass beads which are very durable and long lsting. We are dealing in Brass Bead. Available in pure gold plated or others, ie - silver /black/copper/nickel plated. Brass beads with large and small hole to slide into fly hook. R. G. Saga Exports Private Limited. Keeping in the mind the different needs of our valued clients, we are actively committed towards offering premium quality Brass Beads. Our clients can avail from us, an enticing range of Brass Beads & Pendants, which is designed and developed using premium quality raw material. These pendants are widely acknowledged for their innovative designs, shining look and unique patterns. All the products are offered to our clients in varied specifications, as per their demands. Our assortment of Glass and Brass Beads marks an additional star to your personality and reflects the high fashion taste of an individual. These have been crafted with modern designs and exemplary colors. Our range includes Glass, horn, Bone, Metal, Stone and Chemical (poly resin) Beads. 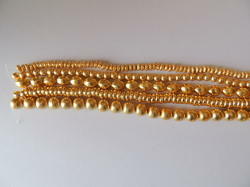 We are instrumental in offering fine quality Designer Brass Beads. These jewelry items are available with us in bulk with tamper proof packaging owing to our well-equipped warehouse and packaging unit. The offered products are known for their eye-catching design, longer functional life and elegant appearance. We are one of the leading manufacturer and exporter of Brass Beads. We also have metallic plated beads that are available in range like round beads, plain and fancy, corrugated, tubes, liquid silver heishi in gold-filled and rondelles (spacers). Our company has achieved laurels for providing Brass Cone Beads to the clients. 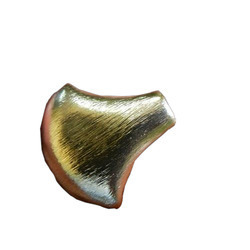 This product is manufactured using premium quality brass and the contemporary techniques with the implication of progressive techniques as per the set industry standards. Offered range can be availed at pocket friendly price.